Deer hunting season starts tomorrow. What do I tell this deer now crossing the road? Do I warn him, wish him well, or say goodbye? I was running through these options when he gave me a quick over the shoulder look and jumped into the woods. Somebody’s dinner meat? 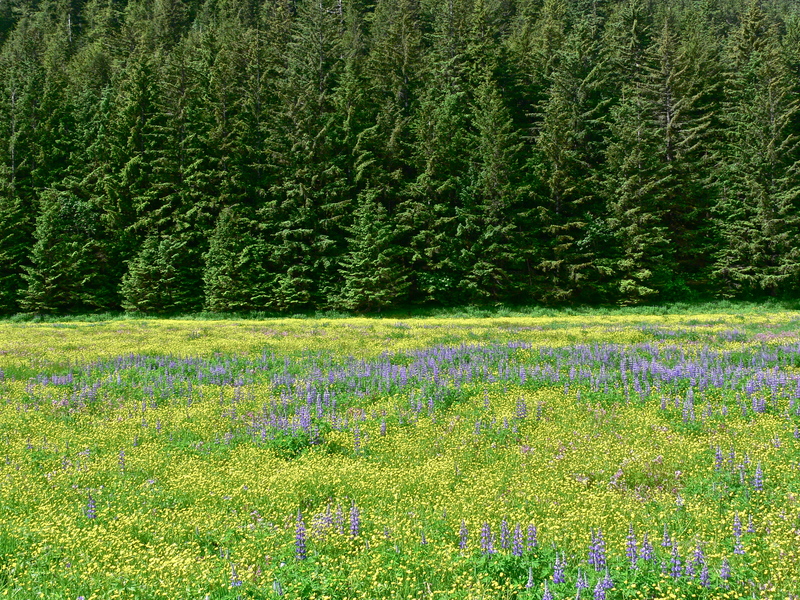 Today isn’t about the deer or hunting or even the amazing wildflowers in full bloom on this rain soaked mountain meadow. I’m here for the bugs and it’s Robert Armstrong’s fault. If he and Kathy Hocker and John Hudson hadn’t written an excellent book on the aquatic insects of Alaska, Aki and I wouldn’t be standing on the edge of this small pond looking for mosquito larva. Armstrong promised that if we make a cautious approach we could see the larva hanging just below the water surface with only the tip of their breathing tube exposed to the air. He didn’t mention rain and I never considered how it might discourage mosquito larva. We don’t see any larva. There is a large water strider trying to make his way across the water surface to safe harbor in some pond side grass. 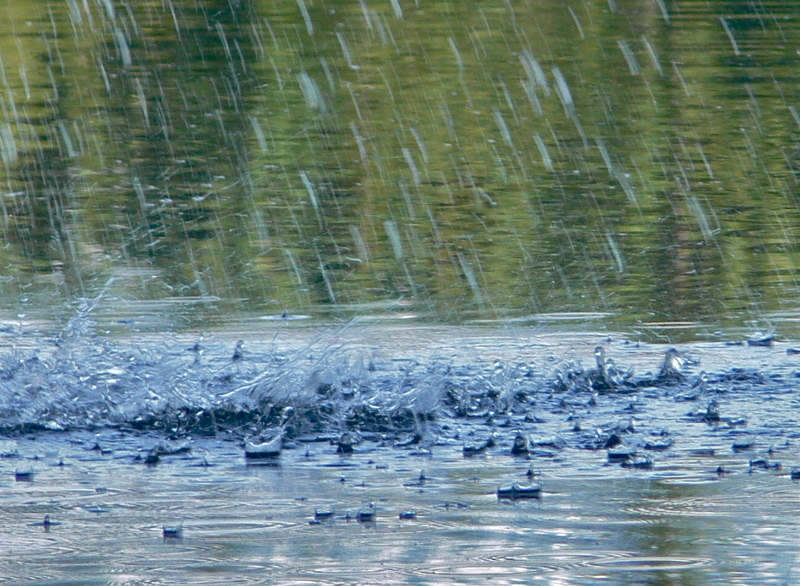 The strider fights the wind and the concentric waves created by each rain drop hitting the pond. Sometimes these collide with each other to create confusion on the water surface. If the strider hit one of these pockets would the surface tension beneath his feet collapse to sink him to the bottom of pond? Now we have drama that distracts us from the rain until the strider disappears in an undercut running along one side of the pond. After the pond I return to my cataloging of the songs made by the mountain water courses. It’s a good day for it with heavy constant rainfall charging the rivulets and streams. I struggle to come up with new terms to replace those that have now become cliches. A small stream draining this field of magenta shooting stars makes a laughing sound moving along side the trail. Others gurgle or slosh or even roar when they pass through culverts under the trail. All the watercourses eventually join Fish Creek. The trail takes us to a small bridge crossing the creek, which blocks out the sound of wind and bird song with its violent symphony. The energy of the swollen stream draw me with an implied promise that by standing here long enough I can absorb its power and understand the things it had seen in its short passage from snow fields to here. It’s a musical rope woven from all the songs of its tributaries. I try without success to tease out the strands of song and find the contributions of at least one song in my catalogue of watercourse sound. Aki, who didn’t want to join me on the bridge, cringes at my feet. Does she know she would never survive a dunking in the fast moving stream? More likely the stream noise hurts her ears. Either way she needs to move so we turn and start the climb through the rain soaked meadows to home. This entry was posted in Uncategorized on June 30, 2012 by Dan Branch. It’s day two of sun. Tomorrow they forecast rain so Aki are crossing through the troll woods with plans to skirt around the flooded beaver lands while they are still in high summer. A sad and desperate call dominates the woods when we pass beyond reach of the road noise. The simple song could be sung by a loon but it lacks the erie complexity of their music. Again and again the bird calls out as if keening his dead — a jarring contrast to warming sun on my face and the happy work songs of their other birds. There is no one to ask about the sorrowful bird song. We are alone on this windless morning. Something crashes out of the water just as we reach the shore of one of the moraine lakes. 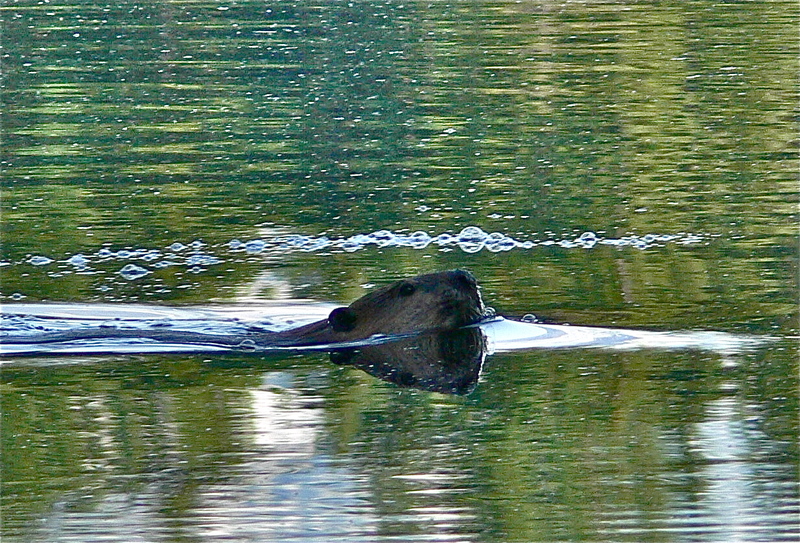 It’s the noisy beaver we watched cruise back and forth across the lake a few weeks ago. 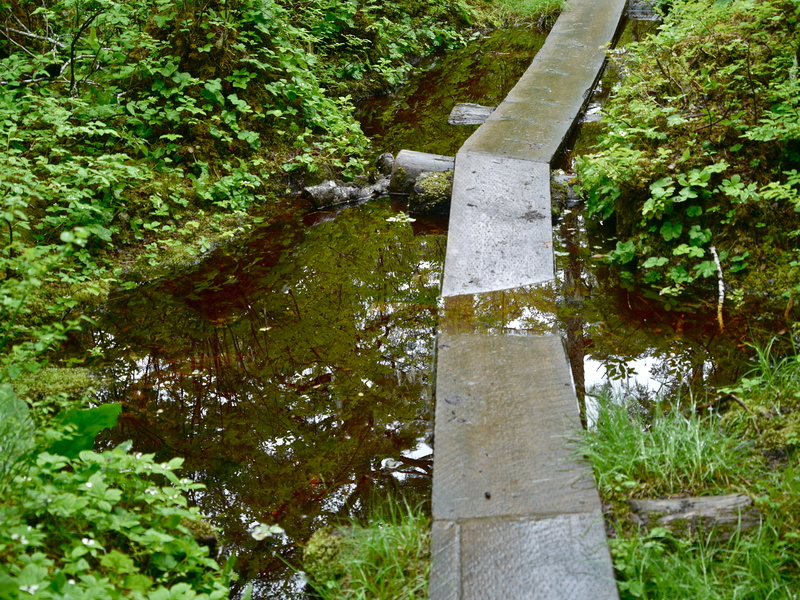 There is a small causeway, maybe half a meter across, that we must cross to get to the main trail. It separates the lake from a small outlet stream. The beaver stops on the causeway long enough for me to realize he is small and maybe only a year old. Then he slips into the water to begin his swim back and forth across the narrow foot of the lake. Like the last time on each lap he slaps his tail and dives just before reaching the lake shore. After watching the beaver for a bit Aki and return to the causeway to figure out the deal. The beaver has been busy hauling mud from the lake to a small dam he has started on the outlet stream. The dam is not needed to maintain the lake level. Maybe the beaver doesn’t know that. Maybe he needs the damn to mark this as his territory. That would explain all the overt swimming and tail slapping behavior, which could be designed to keep away other beavers looking for territory. Whatever the reason, the beaver’s dam building is a dangerous activity for this section of the trail gets heavy use by dog walkers, some accompanied by beasts big enough to do in the beaver. Not wishing to cause the beaver more stress we move down trail to where an old beaver dam offers access to high ground surrounding Norton Lake. It’s our only option as beavers have flooded out the main trail. Here we find newly hatched dragon flies glittering in the sun. I love the electric blue ones that some call darning needles. Mine might be the last generation to know what inspired the nickname. Out of the lake ducks drift without much effort. I find an oddly passive huddle of ducks in some nearby reeds. 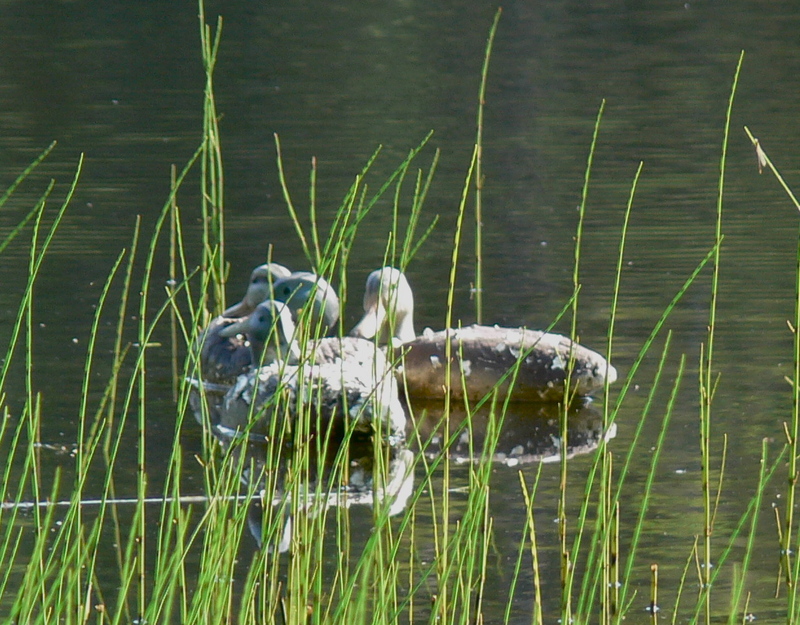 At first I think the stationary ducks are someone’s decoys that ended up tangled together in the reeds. Then I noticed that they were covered with tuffs of white down, which along with the piercing gaze of one of the ducks suggests they are alive but molting. Later I checked some reference books and realized that they must be escaped decoys. After circumnavigating the lake on the beaver’s logging trails we return to the Troll Woods for the trip home. The wind is up now, erasing all the beautiful reflections I enjoyed on the Troll Wood lakes. We pass a little pocket lake — the one where I can only find one drake duck. We saw him this morning and I wondered if he sang the keening song we heard at the beginning of the hike. On this return trip we find he has no cause to cry. 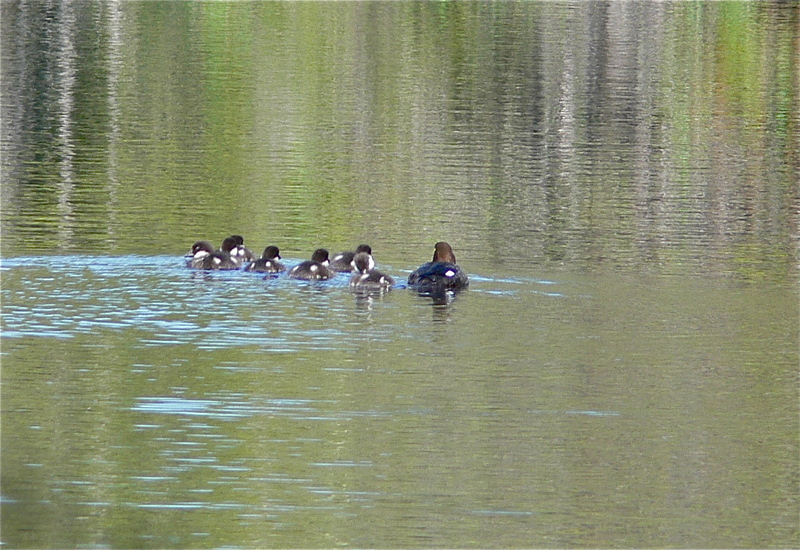 A hen with 7 or 8 chicks swims on his lake. 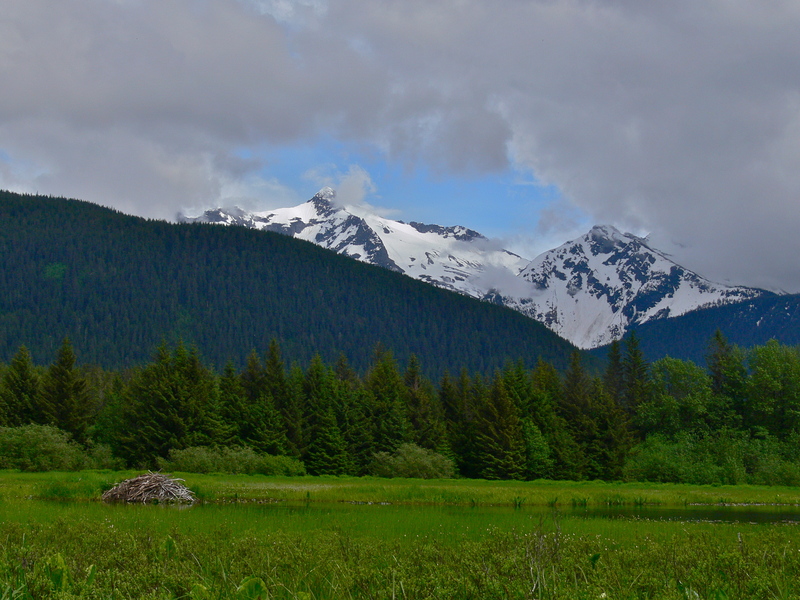 This entry was posted in Aki, Beavers, Dan Branch, glacier moraine, Juneau, Kwethluk, Nature, Southeast Alaska on June 24, 2012 by Dan Branch. We return to this riverine forest, an old friend, and find it covered up in green. She‘s shown us everything before — mud and gravel, bare branch and twigs, rodent holes and glacier erratics. Today, the hottest of the summer, she hides everything behind a living wall. If there are animals here they hide themselves as well. Once I hear a raven grumble then an eagle complain. Then only the buzz of insects. Without wind to blow them away, the mosquitos swarm over me when I stop to take a picture. The pest’s work shows in the resulting photos with their awkward framing and lighting problems. The bugs don’t bother Aki, nor does the blinding effect of foliage. A creature of the nose, the forest is still rich in smells. Only many hikes she trots behind me but today prefers to patrol ahead. Fortunately she passes a huge porcupine just off the trail without seeing him. Startled by our presence the porcupine makes a lumbering escape deeper into the woods, the forest of sharp quills on his back the only thing showing above the grass. His noisy passage draws Aki’s attention and soon she is by my side watching the porky get away. She wants to give chase but honors my request to move on, saving both of us from an expensive visit to the veterinarian for quill removal. Years ago, when I had a dog team in Northern Alaska, I’d keep them on a breezy beach in the summer where they could relax in the sun while wind kept the mosquitos at bay. Each morning they would howl when I approached with breakfast then immediately devour what food was placed in front of them. One day, after everyone’s food dish was full I noticed that one dog, the one dead center of a circle of dogs, was not eating. He couldn’t because of a mouth filled with porcupine quills. Somehow a porky had walked past the parameter dogs up to the victim dog, and then after filling his mouth with quills, passed back out of the circle to the woods. The porcupine could have easily walked around the dog yard. Maybe he was trying to win a bet with the beaver or one of the weasels that lived downriver. Fortunately with a set of pliers and scissors to cut off the quill tips I was able to remove them all. The dog was finishing his breakfast as I was walking back to the cabin. I can’t see Aki being patience enough to allow me to remove quills from her mouth. After our near brush with the porcupine we move over to the riverside meadow, now sporting a good display of blue lupine, yellow buttercups, and magenta shooting stars. The sun is high now, robbing the scene of its usual drama. While the river, grass, and flowers shimmer and shine, the mountains look to be painted on backdrop canvas. 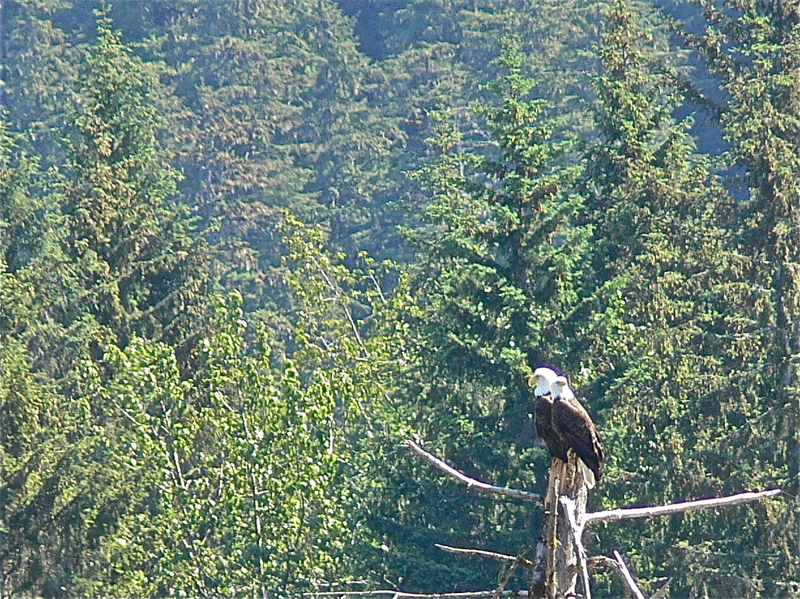 Two mature bald eagles appear to doze over by the riverbank until one flies away. The other tries to hide behind a clump of glass before making her own escape. Later we see them upriver sharing the top of a mid-stream snag. 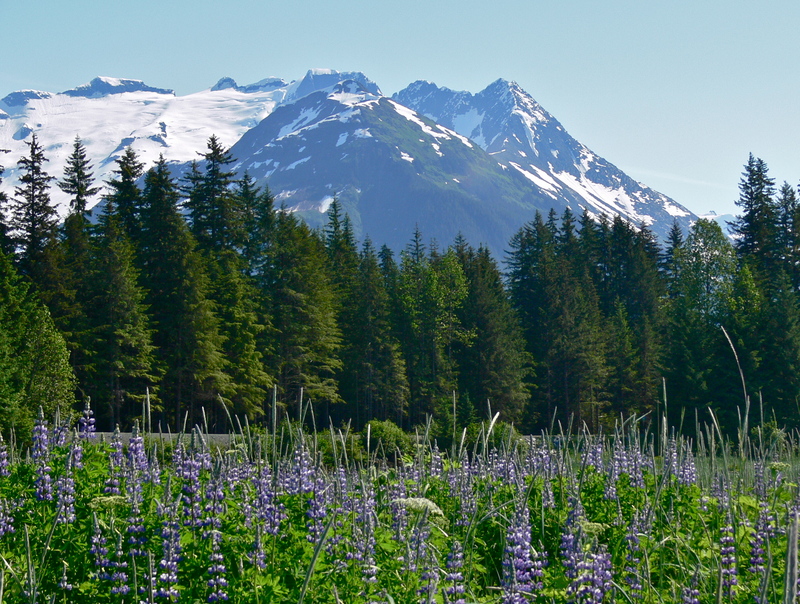 This entry was posted in Aki, Dan Branch, Juneau, Kwethluk, Nature, Southeast Alaska on June 23, 2012 by Dan Branch. This morning I thought about fish and flowers not dog baths. Then we came under the influence of our seductive spirits. It happened at the end of the road where a trail leads across flower choked meadows to the sea. Turn right and walk a half mile and you find the mouth of Kowee Creek. I was hoping to see the meadow in bloom and sunlight. I’d also hope to a catch a fresh from the sea pink salmon at the mouth of Kowee Creek. It’s high season for the mosquitos who plague the Kowee Meadows trail. 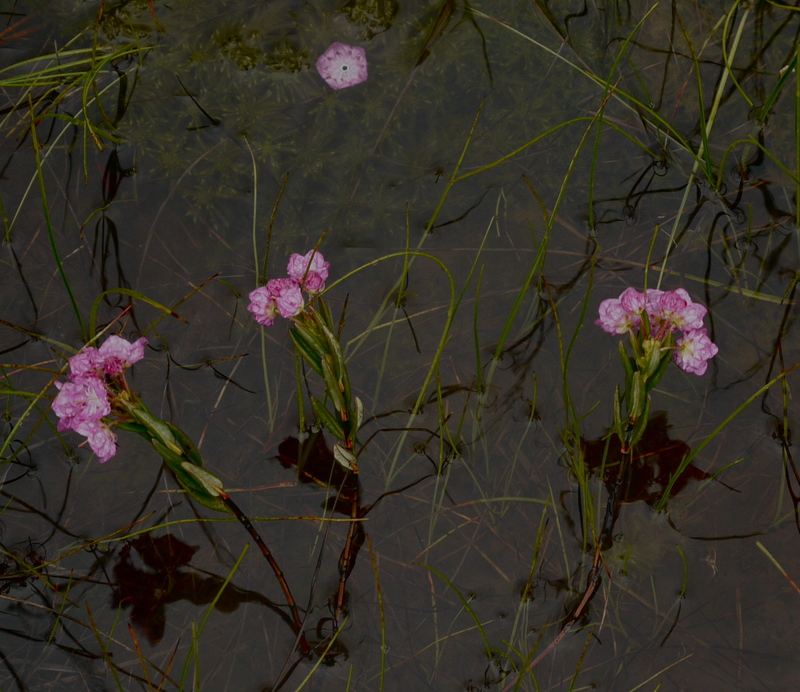 They moved us quickly down the trail, and I stop only for brief snaps of orchids in a muskeg pond and later refections in a beaver pond. At first we were spared a wet muddy walk by a slightly elevated boardwalk. When it ran out we had to cross ground worked to the consistency of a hog wallow by other hikers. Usually Aki manages to prance around the worse of a muddy trail to return the car with clean fur. This is how she started down the trail. Then a beautiful dog, cut in the shape of a Yukon River sled dog, arrived. It was white with black spots and the long legs of its bred. Aki chased and followed it through the worse of the bog holes and returned to me with legs coated with mud. “King” the sled dog barely took on any color. King and his young owner were with us when we followed the trail onto a now flooded trail. Beavers. We could see their domed home rising at the edge of a large pond backdropped by a ridge of black and white mountains. King and his owner continued on down the trail. I turned us back when I saw water rise above her boots and then reach half way up her calf. Beavers. The sun was breaking through the clouds now and I could see a blanket of yellow and purple flowers in the near distance. Resisting this natural seduction I turned back to the forest and we followed the old trail now abandoned to windfalls and mud. Later, feeling good about still having dry socks I lead us onto the meadow trail and looked for shooting stars among the crowds of yellow buttercups. purple lupine, and chocolate brown lilies. Spotting a small patch of the magenta shooting stars twenty feet off trail I was tempted to walk over for a closer look. That would be like walking over Renior canvases to get to a Goya that you prefer so I kept to the trail. Leaving the main trail we head down a fainter one across the meadow. Aki shoot ahead to bounce around the meadow, then stops to roll in something. She’s found bear poop. Fortunately bears are grass eaters this time of year so she doesn’t smell too bad. Nothing a bath can’t resolve. We never see the bear that left this calling card, for which I am thankful. 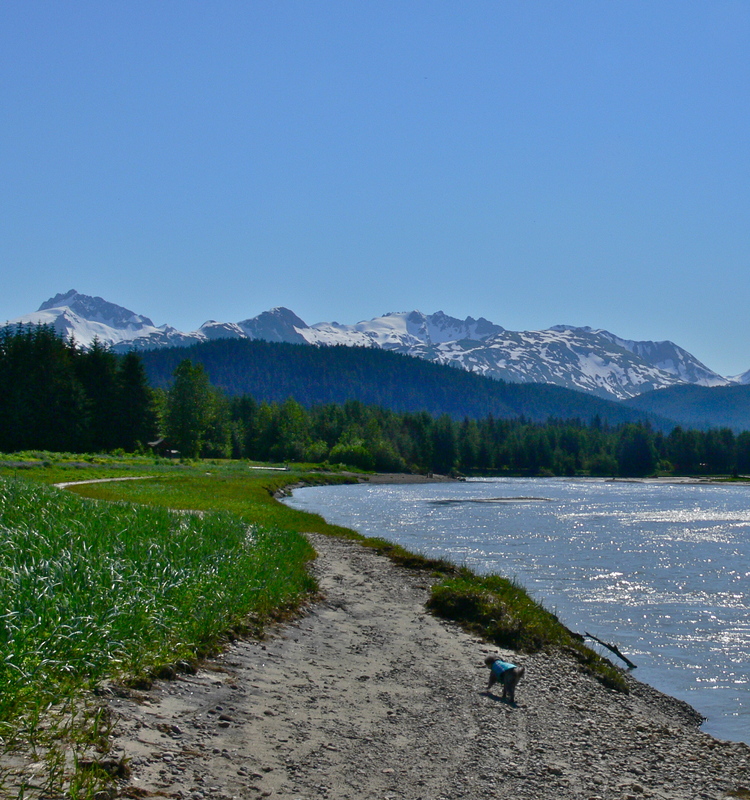 After Aki yielded to the bear we push on to the creek mouth where I catch a couple of Dolly Varden trout for dinner. Normally we’d see humpbacks here but only a red kayak cuts the ocean’s surface. Later we will watch a gang of seals at work in Berner’s Bay before returning to meadow and trail. 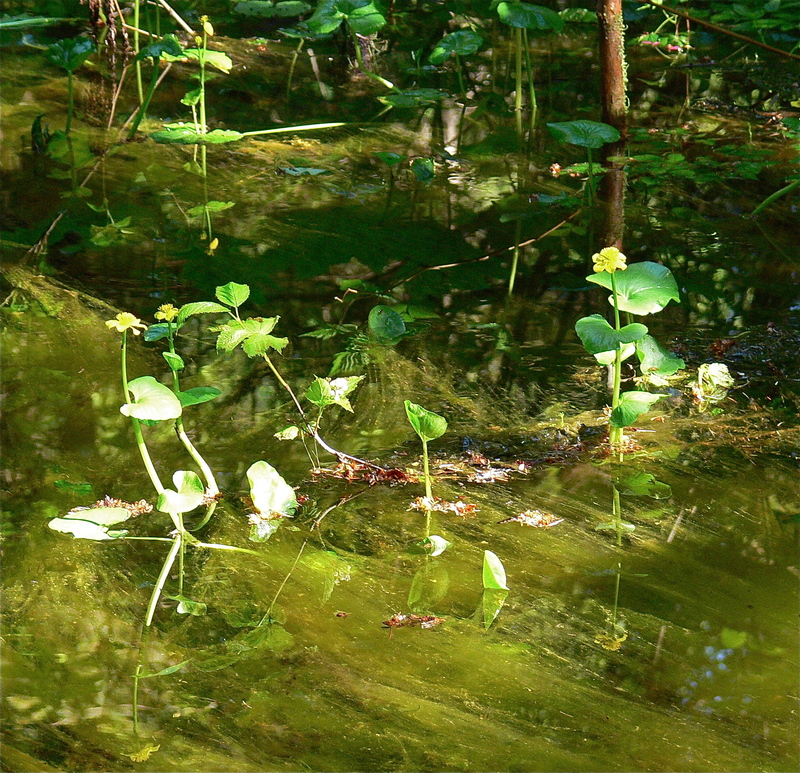 With the sun getting the best out of the meadow flowers I want to stay on the flooded trail rather than return by the muddy tangle that the old trail has become. Feeling that more exposure to beauty is worth a ride home with wet socks I press ahead. This time it is me that gives in to seduction. Aki follows along in my wake, muddy water often up to her chest. Just shy of the place where the beavers have covered the trail with 12 inches of water I spot a dry peninsula of ground leading into the woods. We take it back to old trail and then return without further temptation to the car. 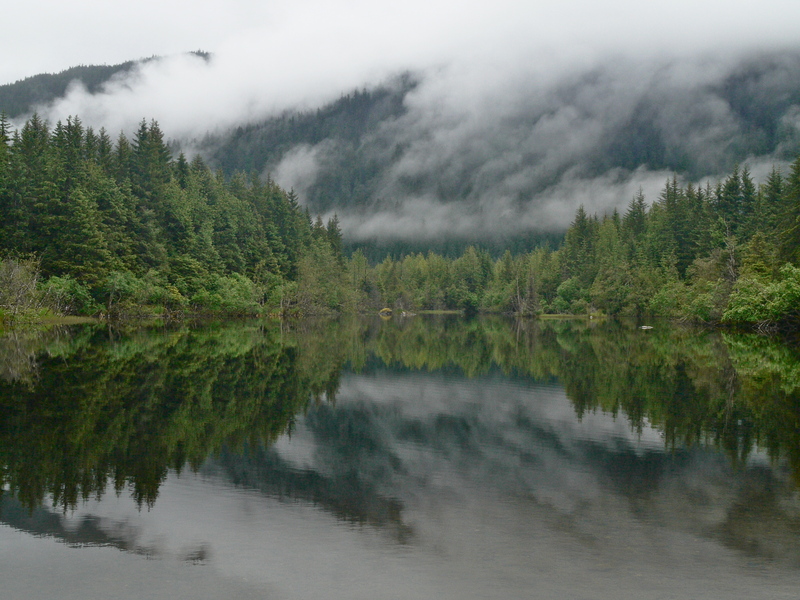 This entry was posted in Aki, Beavers, Dan Branch, Juneau, Kwethluk, Nature, Southeast Alaska on June 20, 2012 by Dan Branch. I didn’t expect beauty on this dull grey day. We walk through an older section of moraine forest. The glacier retreated from it 100 years ago. Since then a series of plant pioneers filled the open gravely space. First came the alders and willows, God’s Band-Aids. Slower growing majesties like the Sitka Spruce eventually forced them out after enough shed willow and alder leaves had built up a soil like medium for growth. Man threw nature a monkey wrench by mining the area for gravel. They left behind shallow lakes that attracted beavers and scared land for more willows and alders to grow. Now we have a wonderful mix of lakes, hardwood plains, and moss covered spruce forests. Back to unexpected beauty. 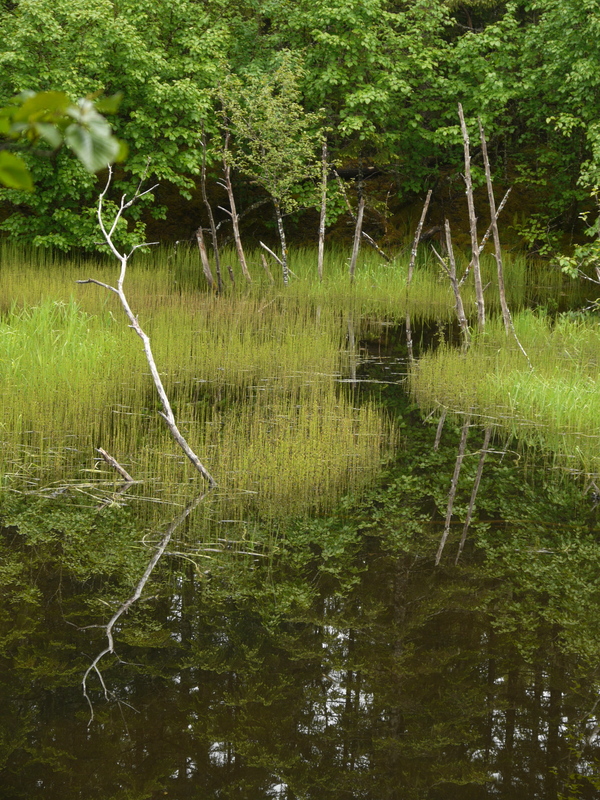 It shows mostly in reflections — some in the lakes and others in the parts of trails flooded by beavers. 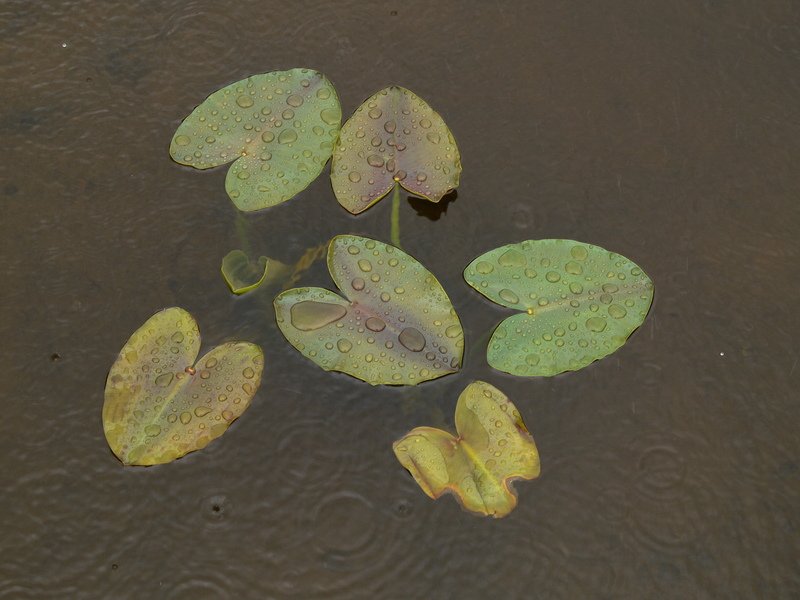 My favorite reflections may be those in tense rain spheres holding on the tops of spreading ferns. The area borders a bedroom neighborhood and Aki soon has many opportunities to make new dog friends. A brace of basset hounds and a husky mix answer her barking call and charge down the trail to us. Aki ducks behind me but is soon chasing about with the bigger dogs. If they get too rough she is back between my legs. 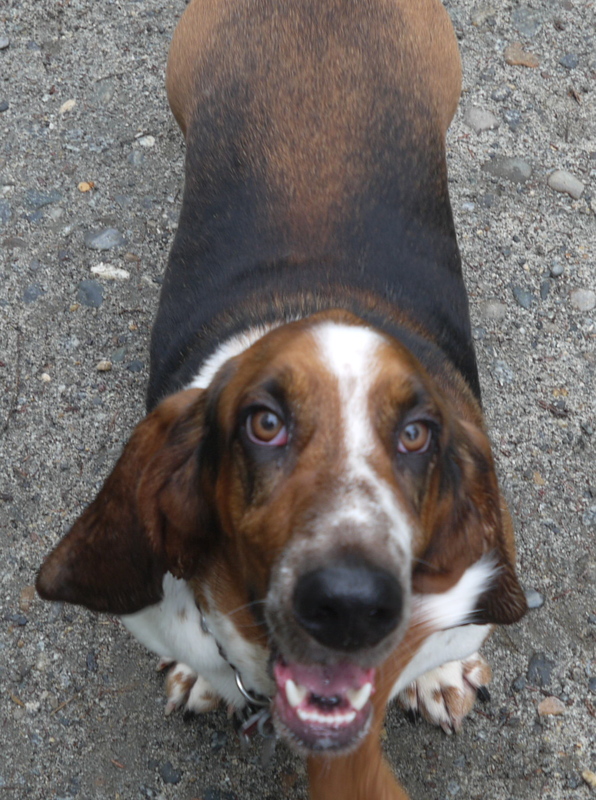 One of the basset hounds plants his front paws on my chest and smiles like a used car salesman. Hoping for a little more solitude I lead us away from the main trail and onto a barely used one that follows the undulates of a rise of gravel that snakes through the forest between two beaver ponds. It’s quiet enough for me to think of the morning bike ride in the rain. Even though I took a road that runs along Gasteneau Channel for miles, the ride was for exercise, not beauty. Then I saw the Orcas (Killer Whales). Five or six whales formed a pod moving up channel toward town. 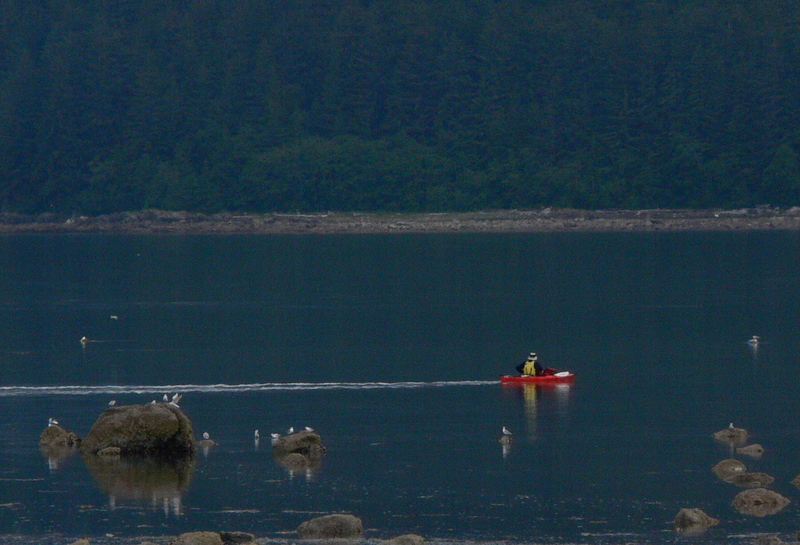 They must be hunting the king salmon now returning to the hatchery. By rubbing my glasses free of rain I just make them out. A mature male, with a massive dorsal fin was the easiest to follow as he rolled to the surface, exhaled and then immediately dipped below the water. Soon I saw the others, their dorsal fins moving up out the water and then down like so many saw blade teeth. Earlier in the ride someone told me about the whales. I figured that I had ridden right by them on the way out of town and wouldn’t see them on my return trip. Did it matter? The amazement should come from the whales’ presence in my home waters. It should be enough to know that they are there but it is not. I found that out when I saw them. That’s when you get the connection, the affirmation that they are swimming in local waters and breathing the same air as you. 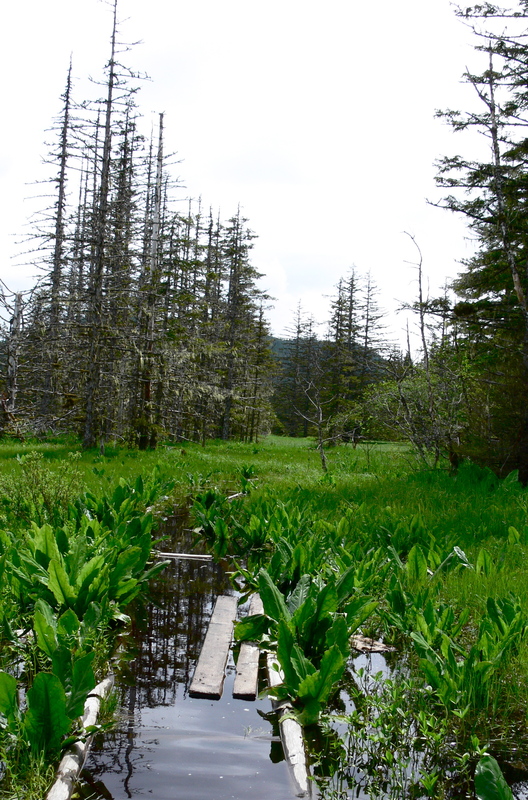 This entry was posted in Aki, Beavers, Dan Branch, glacier moraine, Juneau, Kwethluk, Nature, Southeast Alaska on June 17, 2012 by Dan Branch. It’s been two weeks since Aki’s last adventure so she follows in my wake as I walk around the house on his wet Saturday morning. I’ll not leave without her notice. Rain pounds down on Chicken Ridge like it has many times this summer. A heavy marine layer of clouds obscures the mountains, leaving us in a wet grey and green world. Days like this justify the vibrant colored doors on our neighbor’s Craftsman style homes. 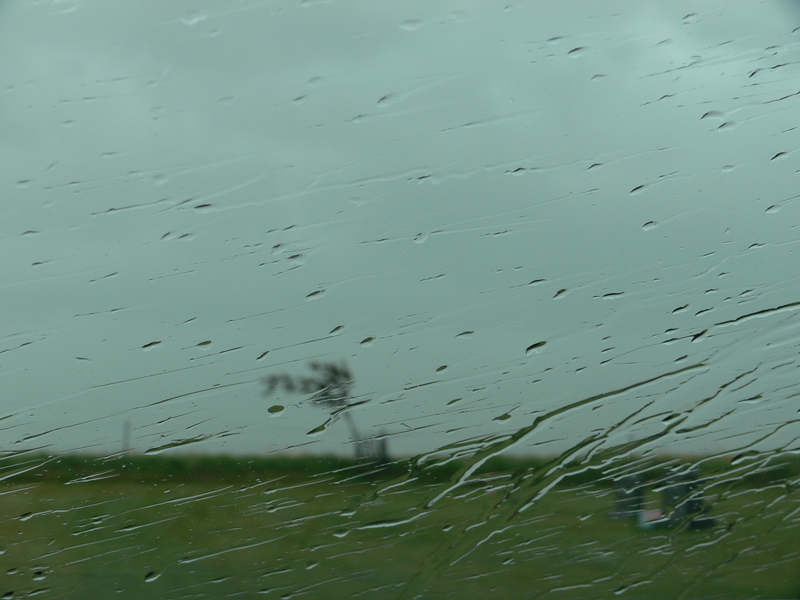 The rain storm strengthens as we drive to the trail head requiring the top setting on our car’s windshield wipers. Aki strains to see through rain obscured window glass for a clue of our destination. I could tell her that we head for North Douglas Island and a forested trail often spared heavy rain. Today only a light sprinkle greets us when we leave the car in an empty trailhead parking area. The rain in town must be keeping other hikers indoors. A few hundred meters into the woods we pass under a tree where some eagles scream and hurl accusations at each other in an apparent battle for roosting space. Offering only a view of a reed choked shallow pond, I can’t figure out why the big birds hang here rather than over on the beach or the nearby salmon stream. Small rain thickened water courses flood under the elevated sections of the boardwalk trail. The wooden trail boards float in others. The rain has stopped and with no wind to ruffle the trail side waters they offer perfect reflections of the surrounding forest. When the trail crosses a small muskeg meadow dominated by twisted bull pines I wish the clouds to lift so we can see the ridge of mountains to the east. 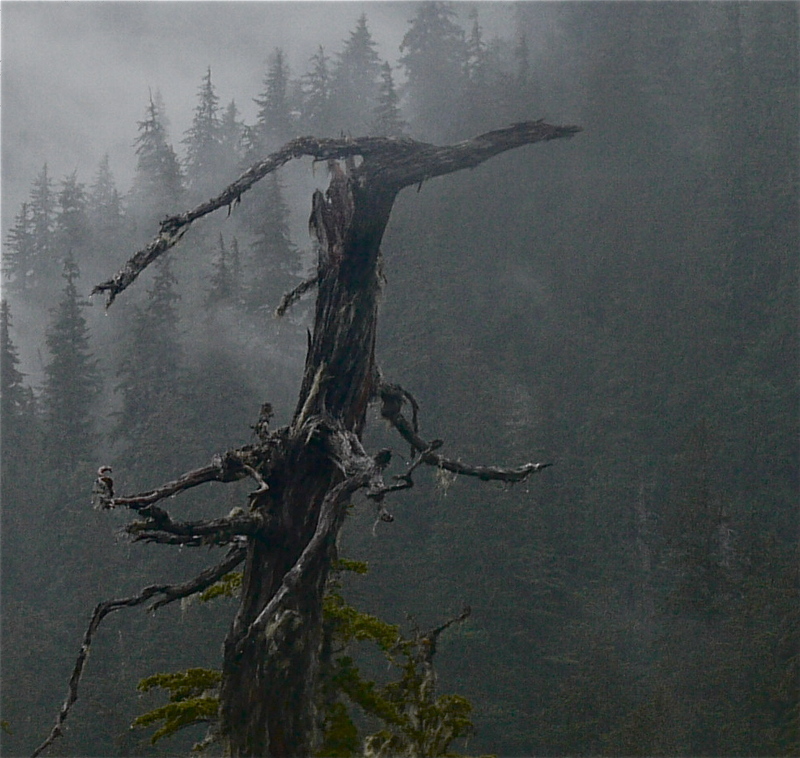 The stubborn clouds darken and drift lower to backdrop the rage of some dying pines. If nature seems angry or disappointed today, I am not. We have the forest and beaches to ourselves, The rain has stopped but not before decorating the flowers and leaves of the trail side berries with moist magic. It’s been two weeks since Aki’s last adventure so she follows in my wake as I walk around the house on his wet Saturday morning. I’ll not leave without her notice. Rain pounds down on Chicken Ridge like it has many times this summer. A heavy marine layer of clouds obscures the mountains, leaving us in a wet grey and green world. Days like this justify the vibrant colored doors on our neighbor’s Craftsman style homes. The rain storm strengthens as we drive to the trail head requiring the top setting on our car’s windshield wipers. Aki strains to see through rain obscured window glass for a clue of our destination. I could tell her that we head for North Douglas Island and a forested trail often spared heavy rain. Today only a light sprinkle greets us when we leave the car in an empty trailhead parking area. The rain in town must be keeping other hikers indoors. A few hundred meters into the woods we pass under a tree where some eagles scream and hurl accusations at each other in an apparent battle for roosting space. Offering only a view of a reed choked shallow pond, I can’t figure out why the big birds hang here rather than over on the beach or the nearby salmon stream. Small rain thickened water courses flood under the elevated sections of the boardwalk trail. The wooden trail boards float in others. The rain has stopped and with no wind to ruffle the trail side waters they offer perfect reflections of the surrounding forest. 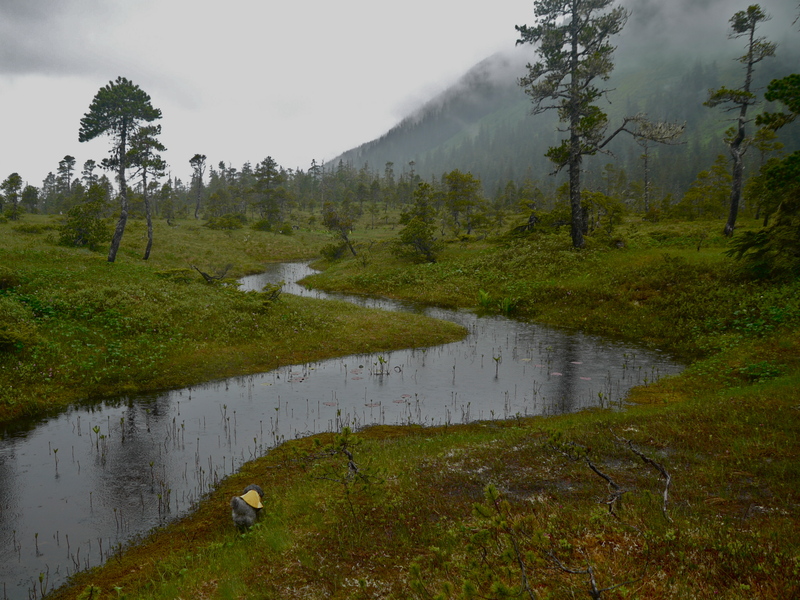 When the trail crosses a small muskeg meadow dominated by twisted bull pines I wish the clouds to lift so we can see the ridge of mountains to the east. 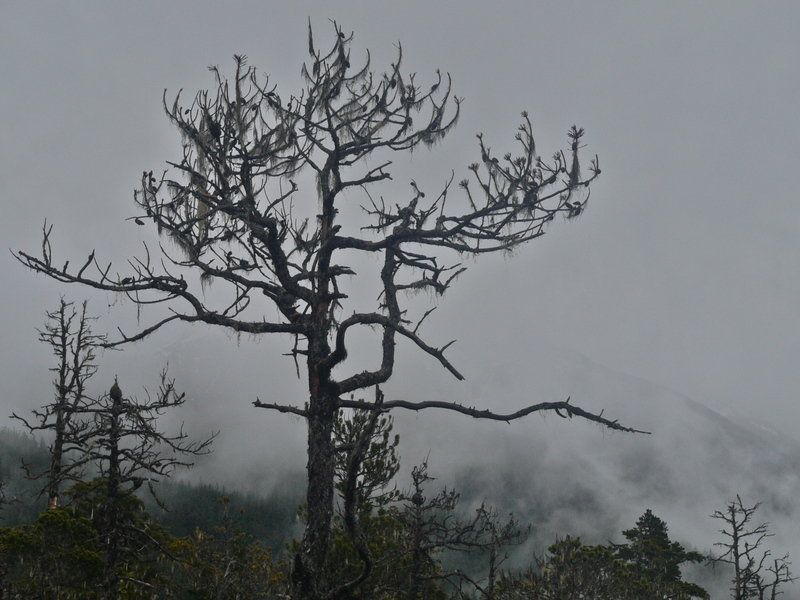 The stubborn clouds darken and drift lower to backdrop the rage of some dying pines. If nature seems angry or disappointed today, I am not. 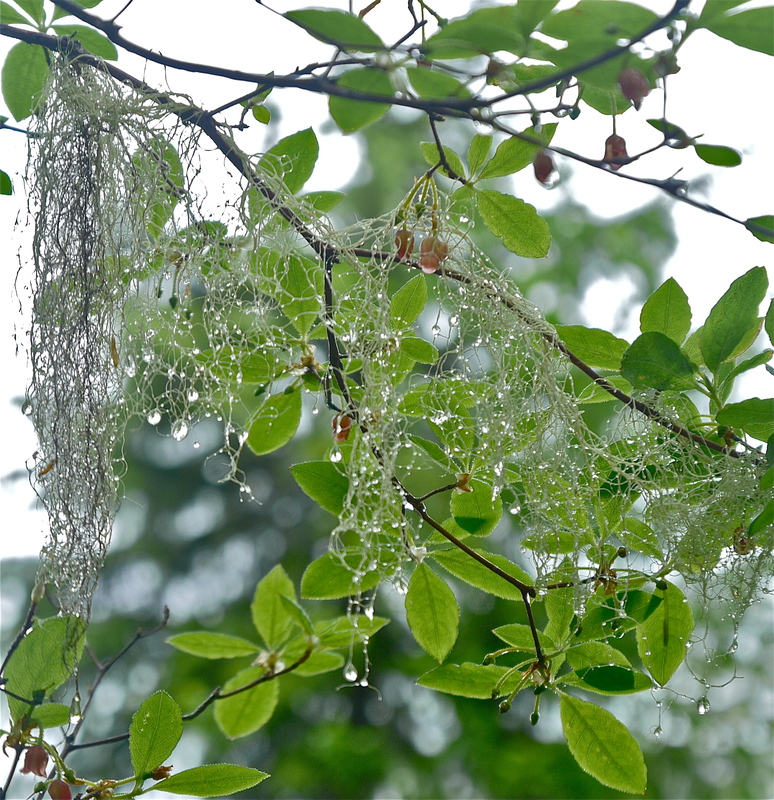 We have the forest and beaches to ourselves, The rain has stopped but not before decorating the flowers and leaves of the trail side berries with moist magic. 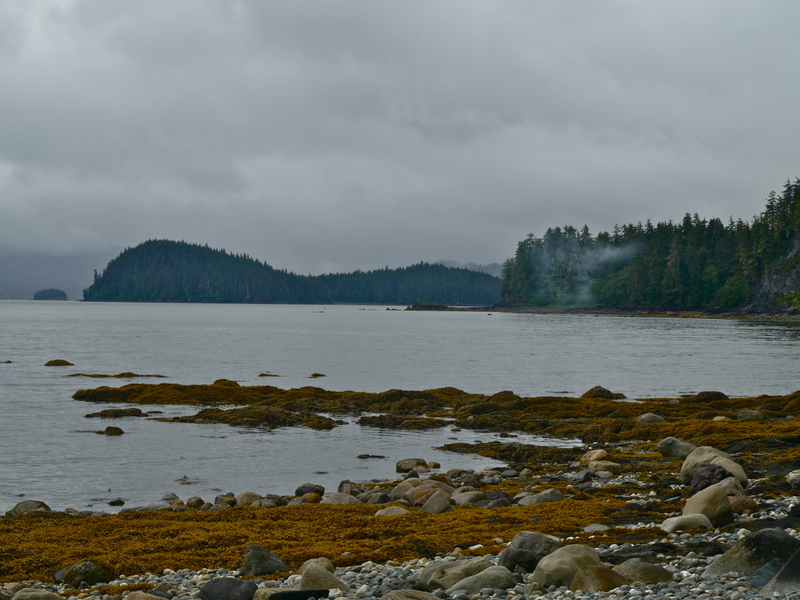 This entry was posted in Aki, Dan Branch, Juneau, Kwethluk, Nature, peaceful isolation, Southeast Alaska on June 16, 2012 by Dan Branch. 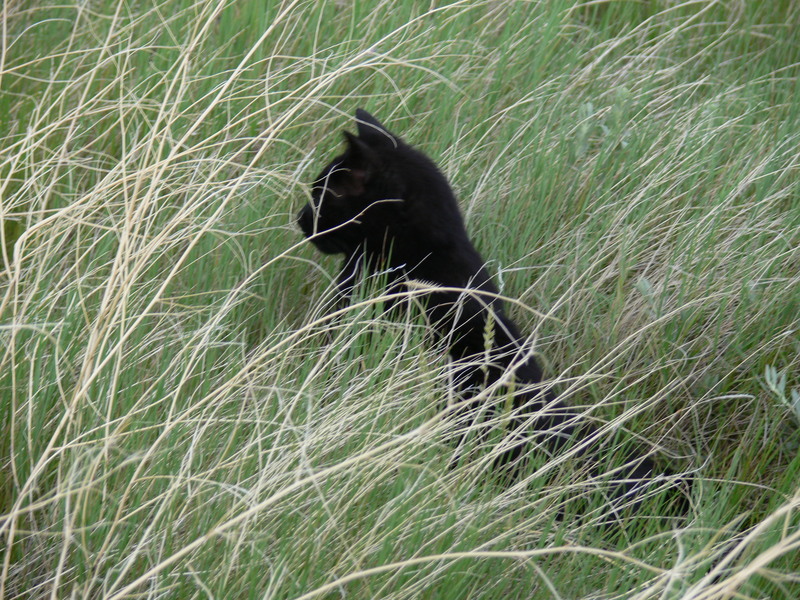 A strange black cat follows as I walk over wheat stubble to the breaks. 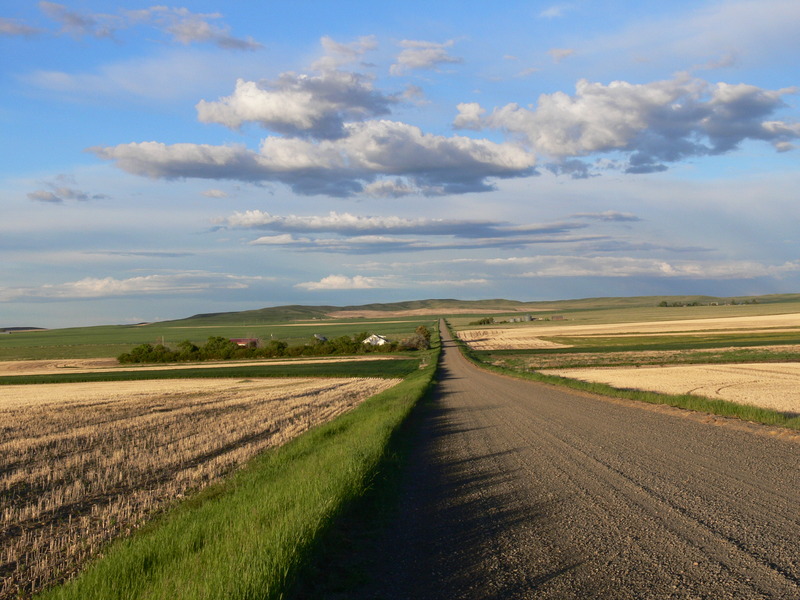 My grandfather homesteaded this piece ofMontanaprairie almost 100 years ago. My Cousin now farms it. Winter wheat, grown on the place without irrigation, supported grandmother and my mother and two of my uncles from their infancy until adulthood. Today the grandkids own it. This black cat has no claim on the land. The cat is a mystery. A friendly gal, it greeted us when we arrived at the ranch house. No one lives here this time of year so the cat was alone. It readily took baloney meat from my sister but otherwise showed no sign of starvation. It only longs for companionship. This morning the cat greeted me at the door then followed me onto the stubble field. Now it walks along beside me if in imitation of Aki. Unlike that little dog, she ignores the small birds trying to distract us from their nests in the wheat field. It is near sunrise and pearly pink light peaks out from under the otherwise universal cloud color. Summer is late in coming this year. It should be warm, if not hot, and the ground of this stubble field should be sun baked brick hard. Instead green weeds grow between rows of six inch high dead wheat stubble and a moist strip of open ground meanders across the wheat field. Normally I stay out of the wheat until harvested but none grows on this moist strip. Others have walked the strip before us. 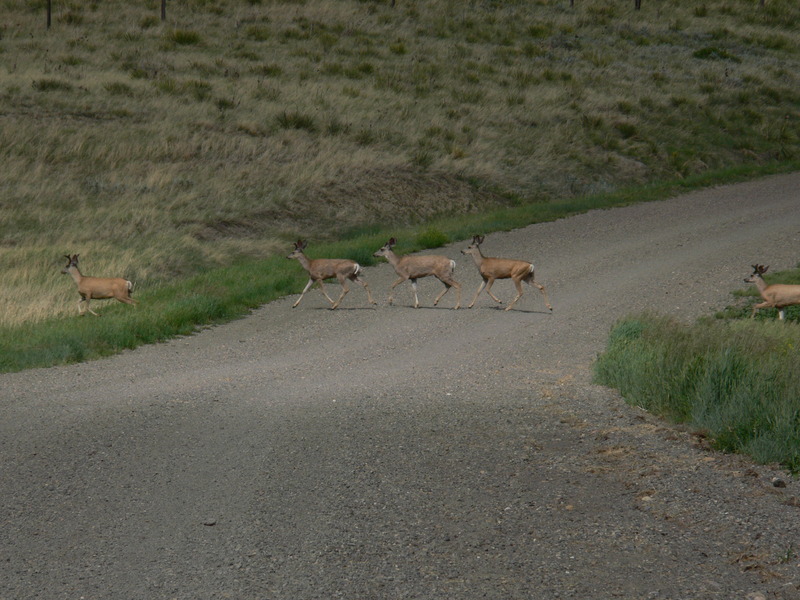 We follow the diminutive tracks of a single pronghorn antelope and heavier ones of a mule deer. Yesterday I saw a gang of six or eight deer cross the road to the ranch but only one tracked this path last night. The tracks lead us to a small raft of mallard ducks floating on a tiny pond where Coyote tracks cross those of the antelope. The ducks fly off before we reach the pond. I still stop to examine it for even small pools of standing water are rare here. 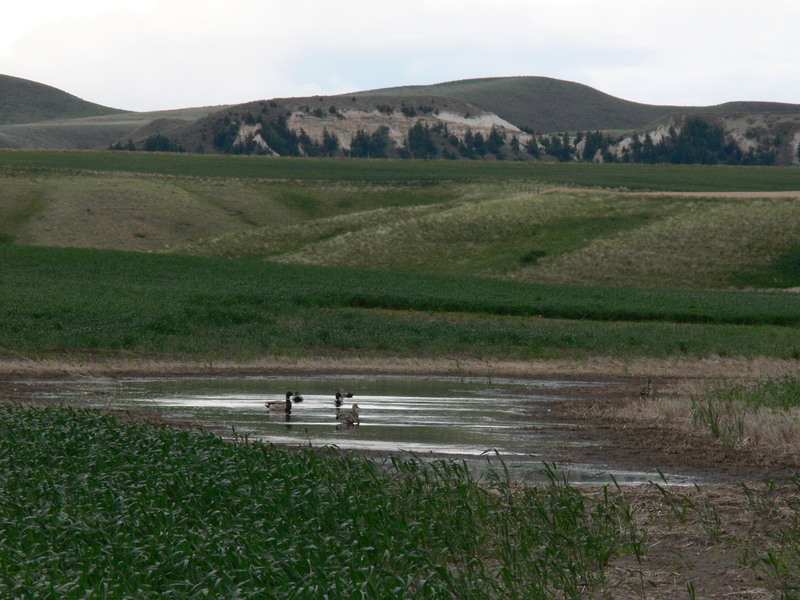 Except for two wheat stalks breaking the surface, the pond is sterile. The path continue beyond the pond and It only takes a minute to pass through the wheat field to another one of stubble. My cousin planted winter wheat here the previous fall and harvested it last summer. Now it rests as a stubble field for a season after harvest. Alternating fields of pale yellow stubble and green growing wheat run to the horizon to produces checkerboard pattern on the flat bench land. 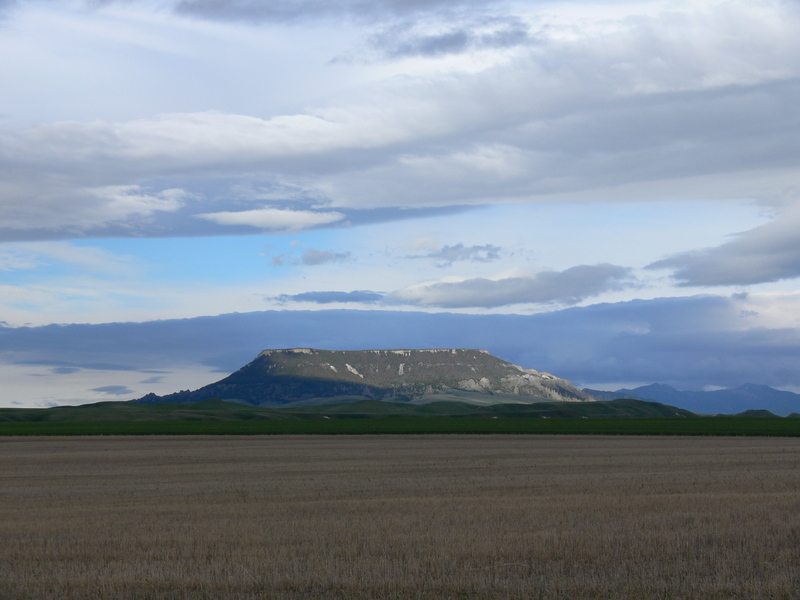 Daylight breaks through briefly to illuminate Square Butte, a weathered flat topped volcanic plug dominating the western horizon. Cat purrs and rubs against my leg as I struggle to focus the camera before the sun leaves. Nothing much makes sense about the cat. She lives alone in a wild place but is not feral. She ignores small birds but takes food from my sister. She follows along like a dependent dog not the aloof cat she is. I begin to wonder if she is more spirit than corporal. Walking on the stubble parallel to the wheat field we eventually reach a barbwire fence that borders still untilled breaks beyond. While the ranch spreads over a flat bench of land, a series of converging dry channels forms the breaks that eventually leads to theMissouri River. A meadow lank sings from its perch on a fence post. Another meadow lark sang during our father’s internment at a nearby cemetery while a small group of pronghorn antelope grazed nearby. Together they softened the pain of burial. Today’s lark song offered similar comfort as I think of those who walked before me to this border fence. The wind rises on my return to the ranch house , now a tiny white box half hidden by the green wheat filed. I continue on the stubble field to the road rather than using the muddy detour through the wheat field. Rain falls in sprinkles at first then turns into heavy wind driven drops. The cat disappears. I expect to find her at the ranch house begging for entrance but she is not there. Maybe a coyote got her or she cut across the fields to another farmstead where she lives. Maybe she really is a spirit, driven away by the Meadow Lark’s song. This entry was posted in Dan Branch, Montana, Nature, Uncategorized on June 11, 2012 by Dan Branch.